Fleetwood defender Conor McLaughlin is grateful for the help Graham Alexander gave him at Highbury but insists there will be no old pals’ act tomorrow, when Town aim to keep their 17-game unbeaten run rolling on at Scunthorpe. McLaughlin, striker David Ball and injured skipper Nathan Pond are the only remaining members of Alexander’s Town team that won the League Two Play-off Final in 2014. Alexander helped McLaughlin to make the international breakthrough with Northern Ireland but the wing-back says any emotion will be left off the pitch as Town seek a victory which would lift them above Alexander’s Iron into second place in League One. He said: “Graham was brilliant for me. He helped my game massively and was a massive help in getting me to the international stage. Another member of that promotion-winning Town team, winger Josh Morris, has teamed up with Alexander again at Glanford Park and has netted 20 goals. Tomorrow he goes head to head with McLaughlin, who added: “Josh has scored a lot of goals, so I will be going out there to try to stop that threat. He is a very good player but they have a lot of good players and we won’t just focus on one. 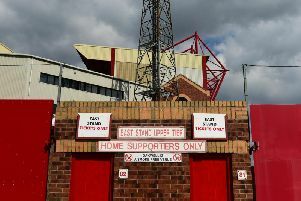 Morris was also part of the Town side that picked up 63 points in their debut League One campaign – a club record Town would surpass with victory tomorrow. McLaughlin said of that target: “The sooner we get there the better, and if it is tomorrow we will be buzzing. But we are all down-to- earth lads and know things can change so quickly, especially in this league. We are not getting ahead of ourselves and there are a lot of tough games coming up. Town surrendered a 2-0 lead to draw with Scunthorpe at Highbury in August and McLaughlin said: “When we played against the bigger sides at the start of the season we did perform well. We led against Scunthorpe, Charlton and Sheffield United and we probably should have seen out those games, but now we have the know-how from those experiences.